Reflecting the theme of “Yanagawa Traditions and Seasonal Color,” the cars of the Suito Yanagawa Sightseeing Train have been designed to capture traditional events like Sagemon and the Hakushu Festival, which have been passed down since ancient times, along with the many owers that blossom in Yanagawa. Designers painstakingly chose colors like Lacquer Black, which symbolizes the samurai culture that lives on in this old castle town, along with a selection of other traditional Japanese colors. In addition to capturing the deep　relationship of Yanagawa to its beautiful, water-rich environment, the　name Suito sounds similar to the word　for “like” in the Hakata dialect. The first car illustrates the autumn and winter sights of Yanagawa. The autumn Choyo no Sekku Festival was held to pray for youth and longevity; the people used chrysanthemum blossoms, which bloom in this season, to celebrate. In late fall, migratory birds fly toward Shotoen Garden in Ohana, where they spend the winter after making the long journey from the Chinese continent. Thus the train depicts chrysanthemums and migratory birds to evoke the fall season and transition to winter. The design of the second car draws from the theme of two major pyrotechnics displays staged in this district each year—the Ariake Fireworks Festival at the height of summer, and the Hakushu Festival in late autumn. The speciflc motifs depicted are the Freworks that light up the night skies over Yanagawa during the two celebrations, and the water-bound parade of donko poled boats, a major highlight of the Hakushu Festival. The third car is styled with the elegant contours of the Japanese iris, the oficial flower of Yanagawa City. These lovely blossoms emerge in all their glory from late May through early June each year, adorning the walkways along the canals and other scenic spots throughout the community. The fourth car in the lineup showcases the white flowers of the karatachi (trifoliate orange) plant that blooms in early May. Today a stone monument engraved with the lyrics of “Karatachi-no-Hana” (“Trifoliate Orange Flowers”), a children’s song penned by famous local poet Hakushu Kitahara, rests next to Yadomi Elementary School. The lyrics describe the charming scenery along the route that Kitahara used to walk to and from this school during his childhood. The fifth car is decorated in a motif inspired by rows of willow trees. These willows are known for the dazzling green of their fresh growth, casting thick and leafy shadows over the water surface. The season is early summer, around the time when the Suitengu Shrine Festival is held to pay reverence to the guardian deity of mariners. The sixth and final car in this eye-catching train features Yanagawa-mari—small ball-shaped hanging paper ornaments unique to the area. Along with other hanging decorations, these delicate spheres are an indispensable element for local Doll (Girl’s) Festival celebrations in early March. This also coincides with the Ohori-biraki (official opening of the canals), when prayers are offered for safety as the gates are opened and waters allowed to fill the dried canals. 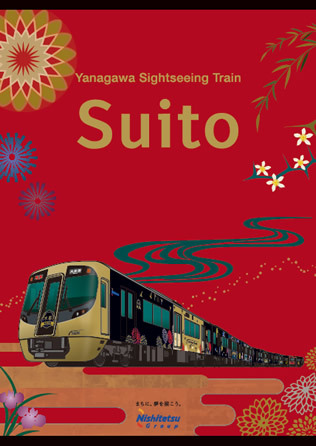 Whether you’re into trains, history, or travel, Suito is the way to go. 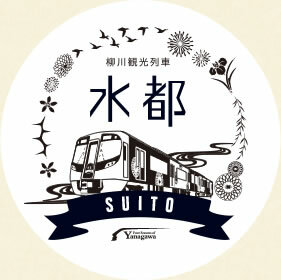 In addition to a unique interior design for each car, Suito features Yanagawa-centric furnishings and exhibits for your enjoyment so that the time you spend getting to your destination will become part of the treasured memories of your trip. 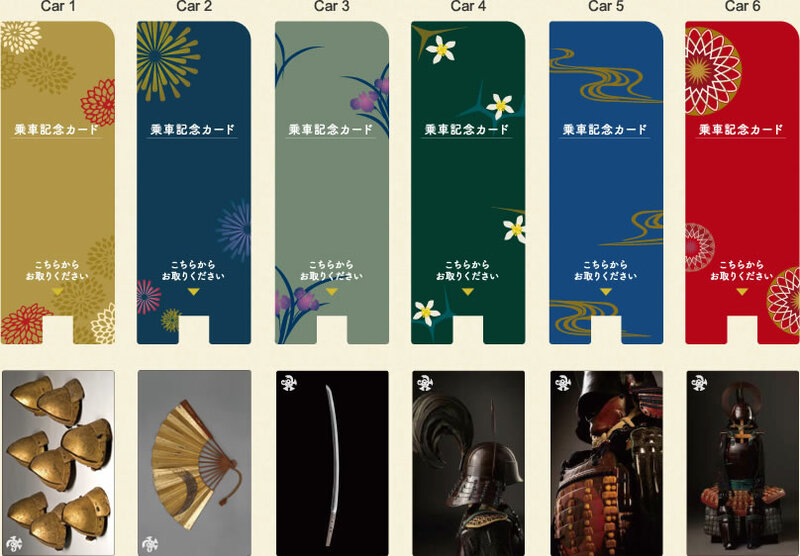 The second car incorporates displays that evoke items from the Tachibana Estate, with a focus on rider stamp objects related to Tachibana Muneshige, the first-generation daimyo of the Yanagawa domain. Collect this series of complimentary cards depicting objects related to Tachibana Muneshige, the rst-generation daimyo of the Yanagawa domain. Each car features its own design in a special dispenser. If you cannot dial this phone number, please call 092-303-3333. COPYRIGHT(C) 2000 - BY NISHI-NIPPON RAILROAD CO., LTD.